What are Chemically-leavened Frozen Goods? Chemically-leavened frozen goods are intermediate bakery products that instead of being baked after mixing and forming, undergo freezing or blast freezing. This is to extend their shelf-life and provide stability to key functional ingredients, allowing them to be shipped to distant markets. Similar to frozen bread dough, industrial bakers serving the sweet goods market started the practice of freezing doughs and batters to decouple the need to bake shortly after mixing and makeup or forming operations. This allowed for greater flexibility and higher plant efficiency as to when and how much dough/batter to bake depending on market needs. Temperature is key for triggering leavening (acid-base in baking powder) reactions and controlling their rates. Solubility of leavening agents (base and acid pair in baking powder). For solutes and dissolved solids, the lower the temperature, the lower the solubility. Water availability is essential for the leavening acids to dissociate and solubilize. Type and amount of leavening system (usually the leavening acid). Adding ingredients that provide freeze-thaw stability. Encapsulation of baking powder as a protective mechanism for chemical leavening stability. Using waxy wheat flours when possible due to their ability to retard staling and preserve dough firmness. Use of time-released (encapsulated) leavening acids (e.g. sodium acid pyrophosphate, SAPP products, MCP, organic acids) is critical in this type of products. During canning, dough is typically filled into tubular cans (of given diameter and length) and then warmed for a few hours to accelerate the reaction of the acid with baking soda causing the dough to expand, creating a positive pressure inside the can and displacement of air that seals the foil inner layer of the can. If premature gas production occurs, i.e. if the dough expands before it is placed in the can, it will be too puffy to fit. Therefore, it is essential that the reaction between the time-released acid and baking soda be delayed until the dough is inside the can. Encapsulation of base component in baking powders (e.g. sodium bicarbonate or potassium bicarbonate) is recommended over their acid counterparts. This is essential for taking advantage of the acid’s function as a preservatives through pH and ionic control. Use of encapsulated baking powder prevents base and acid from reacting and producing neutralization products prematurely (keeping the initial amount of CO2 intact to be released upon melting of coating wall during baking). Encapsulation of baking powders also prevents the solubilization of acid/base and moisture decomposition of baking soda in the dough/batter water. Use of water-binding ingredients such as modified starches and gums (that function as hydrocolloids) is a good measure to increase the stability of the chemical leavening system. 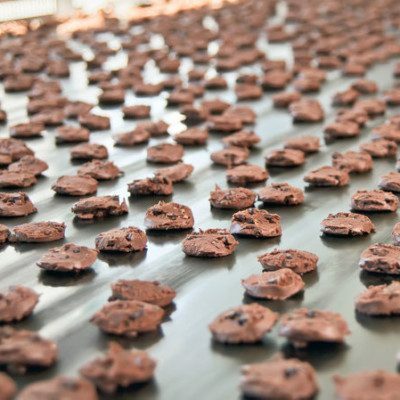 These ingredients reduce the availability of water (helping minimize premature gas production) and also provide freeze-thaw stability to the dough or batter. As a general rule, the higher the temperature (i.e. the warmer the product) during storage, the lower the stability of the chemical leavening system. Under this scenario, encapsulation and/or use of heat-activated or time-released leavening acids is usually a must for refrigerated doughs/batters. Domingues, D., Dowd, C., and Atwell, W. “Refrigerated Dough.” Encyclopedia of Food Grains, 2nd edition, Volume 3: Grain-Based Products and their Processing, Academic Press, Elsevier Ltd., 2016, pp. 359–366. Cauvain, S.P. “Other Bakery Products.” Baking Problems Solved, 2nd edition, Woodhead Publishing, Elsevier Ltd., 2017, pp. 383–390.